No mechanics to worry about and not much storage space required either. For such a small investment we have our eggs personalised which our customers enjoy and it gives us excellent traceability. I have attached a photo of the eggs for you to see." "I have an organic poultry farm, where I produce 650 eggs a day. So I was looking for a fast and effective stamp at a reasonable price. After some tests with other stamps, I discovered that your eggstamp is just perfect. It takes me about 8 to 10 seconds to stamp one pallet of eggs. In addition, the imprint quality is great, numbers and letters are sharp and clear, which gives a very good readability on the eggs." Read the complete letter of recommendation here. "It's a cracker! I'm very pleased with it. The imprint is excellent and far better than I have seen on some commercial eggs which are impossible to interpret (even with a magnifying glass). Thanks again. I will be sure to recommend you." "I want to thank you for the ingenious eggstamp! It is lightweight, very easy to use and better than all eggstamps we bought in the past. We will recommend your eggstamp to all our egg producers. We wish you great success in your business!" "I am a 1 person operation producing around 80 dozen eggs a week. New regulations have come in and now I have to stamp individual eggs. Since receiving the egg stamp I have made a game of seeing how fast I can stamp a dozen eggs. So far my record is 4 seconds. The extra time it takes to stamp eggs and the cost of the stamp is so small that my costs have not gone up really at all. 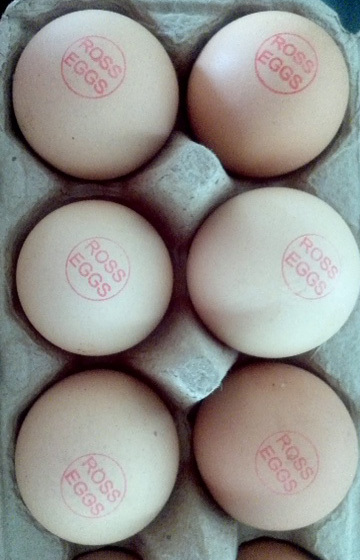 I would recommend the modico egg stamp to any producer who needs a quick and easy method to manually stamp eggs." When my husband told me he wants to buy the egg stamp by modico and stamp the eggs in future, I was more than skeptical. "How can this work with an oval egg at all?" But the stamp has absolutely convinced me! The number is clearly readable, and the required time is not worth talking about! I can recommend the egg stamp to everyone with a clear conscience! "Every day I am marking about 1,000 eggs. Your stamp reduced my work to half an hour." "Thank you for sending my egg stamp, it is totally brilliant. After years of struggle my life is revolutionised"